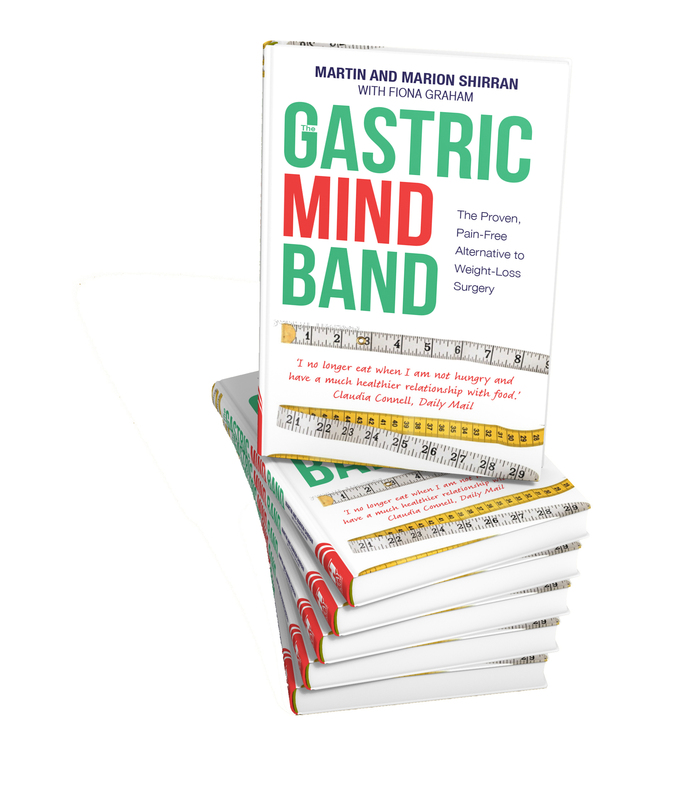 Written by two weight loss professionals, Martin & Marion Shirran - their previous two books Gastric Mind Band and Pause Button Therapy were published internationally by Hay House. Cruising Without the Weight Gain – Cruise Yourself Slim, is about wonderful food and alcohol, beautifully presented, in often luxurious restaurants; it’s about being on holiday and overindulging and the resulting underbelly of cruising, the inevitable weight gain that so many people who have enjoyed a cruise holiday often seem to experience. This book guarantees that your next cruise really can be different. Cruising Without the Weight Gain is possible. 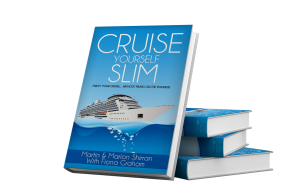 Authors Martin & Marion Shirran are cruise lovers who, coincidentally, have devoted the last ten years to successfully helping people around the world achieve permanent weight loss, using their Gastric Mind Band therapy. Visit the Gastric Mind Band website to read more about the Shirrans’ psychological approach to weight loss, which was developed at their Elite Clinic in Spain. Co-written by Fiona Graham, the book is the result of hundreds of hours of talking with and interviewing fellow cruisers: it includes unique data collected from one of the largest polls of cruisers ever undertaken, along with information supplied by many of the leading global cruise lines on the subject of food and weight gain. The foreword of Cruise Yourself Slim was written by keen cruiser Dr. Graham Sceats, a Sydney-based Cardiologist. A chapter features behind the scenes, below deck input, much of it unpublished, supplied by Brian Bruns, an ex cruise line maître d’ and author of ‘Cruise Confidential’. Additional input and assistance was provided by Patsy Morgan, Senior Lecturer in Cruise Tourism at Southampton University in the UK. This is not a diet book, nor is it a guide to cruising; this book is about how it could be different, resulting in healthy cruising. Patsy Morgan – Senior Lecturer in Cruise Tourism, Southampton Solent University. The book will appeal to everyone thinking about taking a cruise holiday, and will also be of equal interest to past cruisers. The sixteen chapters of Cruise Yourself Slim are packed with ‘Must-Have’ information around the subject of on board food and drink and the resulting weight gain so often experienced by cruisers, the book features a number of ‘Takeaways’ guaranteed to prove invaluable to readers. One of the most popular topics discussed among cruisers is around the often inevitable weight gain experienced during their vacation; it is reported that many cruisers can gain as much as 2lb per day. Cruise Yourself Slim will give cruisers ‘The Edge’ showing them how they really can enjoy their cruise holiday, but return home at a similar weight to when they left. Three chapters of the book are exclusively dedicated to a number of tried and proven pre, during and post-cruise techniques, designed to ensure minimal, or zero, weight gain. Devil in a Cocktail Glass, is the chapter covering in-depth aspects around alcohol and also the part it plays in weight gain. The unique information contained in the chapters written by Brian Bruns and Patsy Morgan further enhance the reader’s experience. Brian Bruns is a former cruise ship maître d’, and his experiences on board, both above and below decks, were charted in his best-selling book ‘Cruise Confidential.’ Cruise tourism lecturer, Patsy Morgan, is currently working on a thought-provoking PhD, focussing on how the whole cruise experience might differ quite significantly for people, depending on their weight and size. Information concerning the latest research in Neuroplasticity, Unit Bias & Time Perception as used in the GMB treatment, is also featured. ‘Cruise Yourself Slim’: a must-read handbook for healthy cruisers! Martin Shirran, born in London, and Marion Shirran, born in Hartlepool, established the Elite Clinic in Malaga, Spain in 2004, putting into practice their shared love of helping people. 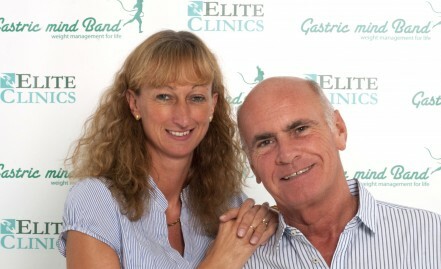 Their groundbreaking Gastric Mind Band© weight loss therapy, covered in their first book, is now widely emulated by other clinics and therapists around the world. Visit www.gmband.com for additional information. Martin & Marion’s work in the field of weight loss has been featured in mainstream media around the world, including magazines such as Vogue and Marie Claire, in newspapers such as the Times, Daily Mail and the Daily Telegraph, and on TV channels in the UK, USA, Australia and Japan. They were invited to present elements of their work at two world conferences on Professor Philip Zimbardo’s Time Perspective Therapy at Coimbra University, Portugal and at Warsaw University, Poland. Both Martin & Marion hold Diplomas in Clinical Hypnosis and are certified and registered with the American Board and British Institutes of Hypnotherapy. Martin & Marion are independently registered with the Complementary and Natural Healthcare Council in the UK. 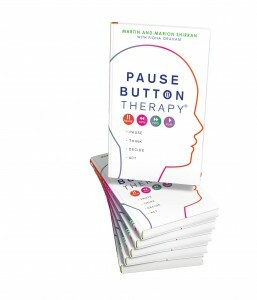 Fiona Graham: a Spain-based former UK journalist, worked with Marion & Martin on their previous two books, Gastric Mind Band® and Pause Button Therapy® both published by Hay House, and was more than happy to step up for this, their third publication! 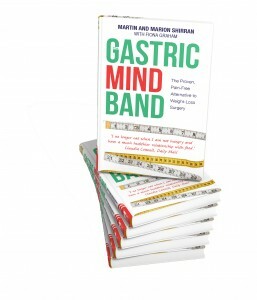 The idea of using the subconscious, rather than invasive gastric band surgery, to convince people they can eat no more than a fraction of their stomach’s normal capacity – Gastric Mind Band the book caught the public’s imagination. The unusual therapy underpins CBT (Cognitive Behaviour Therapy) NLP (Neuro–Linguistic Programming) and Hypnotherapy – in the form of self-hypnosis – to ensure readers actually start changing their whole relationship with food permanently, rather than simply opting for a short–term ‘diet’-type solution. Published by Hay House in 2013. How helpful would it be if we could occasionally just pause, freeze time for a few moments and consider the consequences of the actions we are about to take? 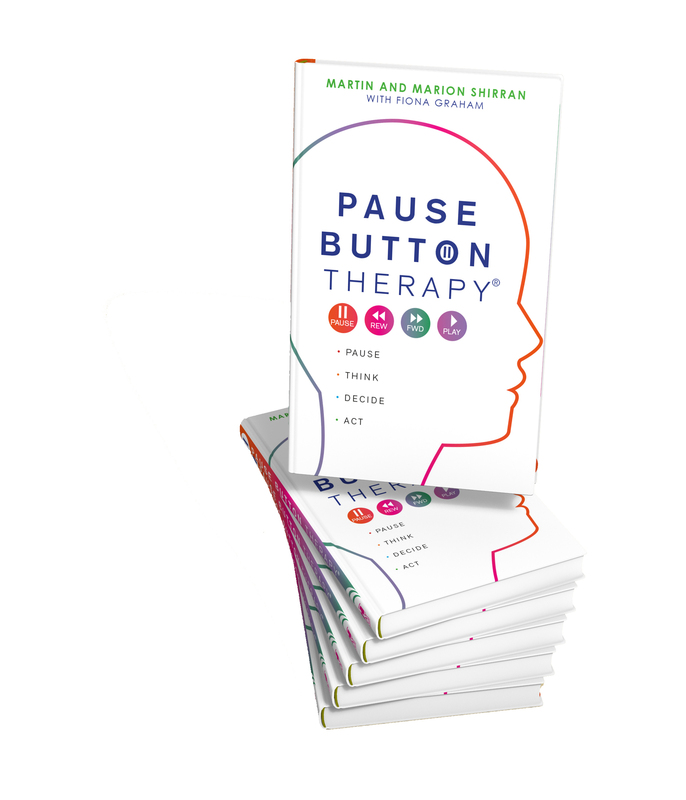 Pause Button Therapy the book is a proven, innovative and interactive therapy technique that allows you to do exactly this, empowering you to break free from negative habits and unconscious responses. PBT is based on an incredibly simple idea, but can be used for a whole host of issues. It provides additional thinking time, allowing a person to consider the potential outcomes of their actions and adjust their behaviour accordingly. PBT has been hugely successful in the treatment of everything from addictions and weight issues to depression, anxiety and relationship problems. The book shows readers the many ways in which they can use the technique to transform their experiences of life. Published by Hay House in 2012. 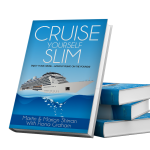 Cruise Yourself Slim is packed with ‘Must-Have’ information around the subject of on board food and drink and the resulting weight gain so often experienced by cruisers. The book additionally contains a wealth of information explaining the weight loss therapy we provide at our Elite Clinic in Fuengirola, Spain. As a special thank you to our readers, we have made available a number of free downloadable features, including a dedicated MP3 audio introduction to Gastric Mind Band, as well as a Visualisation/Relaxation session specifically for cruisers. This studio produced recording is available exclusively for readers of the Cruise Yourself Slim book and is not on general sale: we hope you enjoy it. Please click on an item below, and then enter the username and password contained in the book to start the download. Cruising, Food & Weight Gain Survey 2016.